Synopsis [c/o Barnes & Noble]: "When Fat Charlie's dad named something, it stuck. Like calling Fat Charlie "Fat Charlie." Even now, twenty years later, Charlie Nancy can't shake that name, one of the many embarrassing "gifts" his father bestowed -- before he dropped dead on a karaoke stage and ruined Fat Charlie's life. Because, you see, Charlie's dad wasn't just any dad. He was Anansi, a trickster god, the spider-god. Anansi is the spirit of rebellion, able to overturn the social order, create wealth out of thin air, and baffle the devil. Some said he could cheat even Death himself." Overview: I wrote a while ago about another Neil Gaiman novel called American Gods one of my all time favorite books. 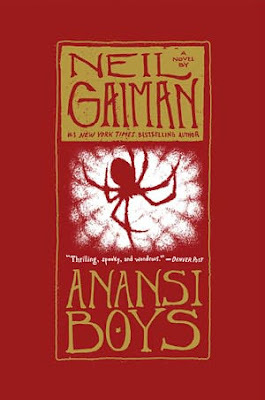 Anansi Boys is yet another example of Gaiman's extraordinary talent, and another one of my top ten favorites. This is the story of Fat Charlie, a very plain and unassuming wall flower that tries to get by without gaining attention. Nothing ever works out for Fat Charlie, especially nothing that has to do with his father or newly found brother. But, after his dad dies, Charlie must tie up some loose ends, and therefore manages to dive headfirst into a lot of family drama. He learns more than he wants about bro and dad, and manages to find himself in the process. Gaiman manages to interweave reality and mythology in a way that leaves the reader wondering if perhaps this world actually does exist. Gaiman, as ever, absolutely enthralls me with his writing styles. If any of you took my advice and perused Good Omens, then you'll know that his way with words will have you doubled over in laughter. He not only entertains with humor, but develops the characters in a way that makes them seem like family or dear friends. The reader watches them grow, and at the end of the novel, sighs with contentment as if they had anything to do with the amazing results. Extremely well written, hilarious, and definitely a must read. Let me know if you enjoy it!